There’s many reasons to find fault with Be Kind Rewind. Let’s start with the sheer ludicrousness of the plot; Mr Fletcher (Danny Glover) is the elderly owner of a failing small video (yes, VHS) rental store in Passaic, NJ, threatened with closure by some cliched evil property developers. For one week he entrusts the store to his clerk Mike (Mos Def) so he can go away to a Fats Waller convention, but also in order to go and check out the methods of the store’s more successful local competition, the large Blockbuster-like West Coast Video. Plot point: Jerry (Jack Black), who works at a garage nearby, and more frequently than not comes into the video store to bother its staff, somehow manages to magnetise himself while breaking into a power station, with the consequence of his erasing all of the shop’s magnetic tapes on his next entry into the shop. Faced with piles of blank cassettes and some angry, impatient customers, most notably Miss Falewicz (Mia Farrow), Jack and Mike elect quickly to whip up a home-made, ‘sweded’, version of her requested film, Ghostbusters. This is all a rather silly, laboured device to set up what follows: Mos Def and Jack Black remaking classic films on a zero-budget. The idea is a good one, and is ultimately the films’ saving grace; who could not find funny the idea of Roger Corman-esque productions of the likes of Robocop, Driving Miss Daisy or even The Umbrellas of Cherbourg? This ‘sweding’ of films has become something of an internet phenomenon, with hundreds of would-be amateur directors having a stab at their own imitations/tributes to classic films. See here. If the recreations are funny, then the rest of the film is decidedly not. 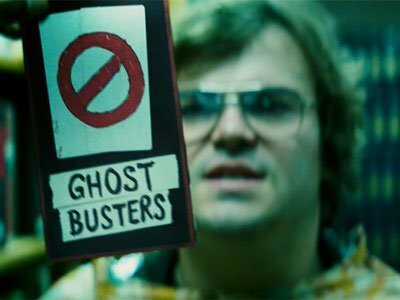 Outside of the sweded world, the characters are ill-drawn and under-performed by what is a talented cast; Jack Black is only just reined in from his annoying worst, i’m never convinced by Mos Def, and Danny Glover and Mia Farrow are left to chew on the scenery. The whimsical plot – involving the threatened demolition of the shop – is weak and unengaging: it is as if the filmmakers put more thought and effort into their micro-Rush Hour 2 then they did with the rest of the script. Unfortunately, this has the effect of rather spoiling what could have been a more thoroughly enjoyable 97 minutes. Michel Gondry, to me, seems to have become a victim of his own success, in that expectations of the quality of his output are still at the level of his masterpiece, Eternal Sunshine of the Spotless Mind (2004). Since then, both this film and The Science of Sleep (2006) have demonstrated his undeniable visual flair and playfulness, but also have lacked the narrative coherence of his earlier film’s watertight Charlie Kaufman script, and so have felt ultimately disappointing. Whether this is fair is questionable; it is certainly not like the case of Wes Anderson, whose films since Rushmore (1998) have shown a director increasingly coasting on autopilot. What Gondry has is imagination and creativity in abundance, what he needs is someone who can focus it constantly in the right direction.